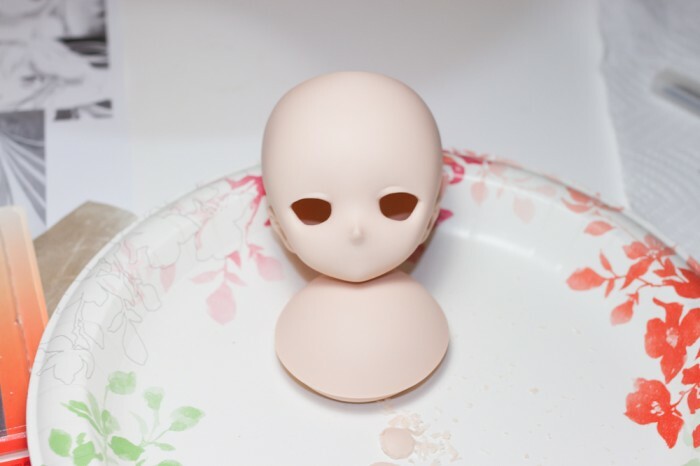 Recently I acquired the DDH-01 softcap head (closed eyes) to play around with. 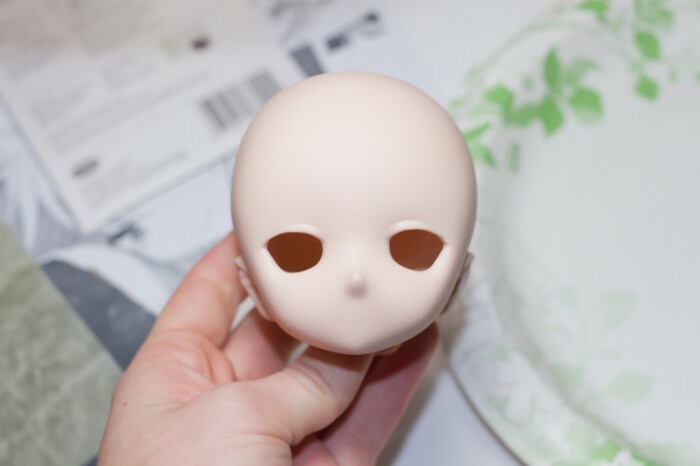 Volks was out of stock of the new open-eyed heads, and since my intention was to mod I went ahead and got the closed eyed. 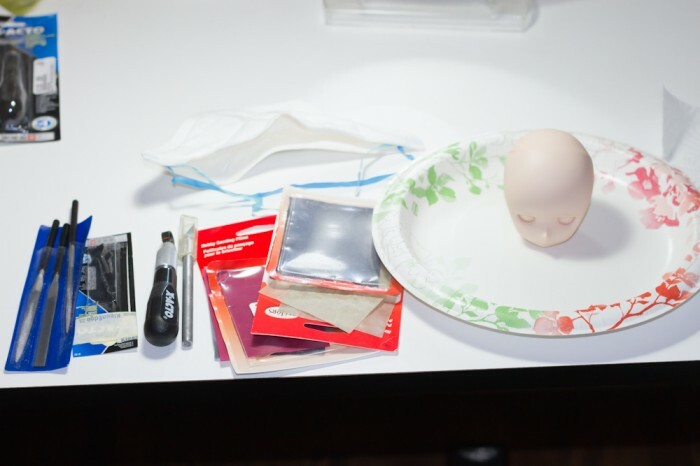 Setup and tools include the trusty paper plate and paper towel, face mask, various grades sanding papers, x-acto knives and carving tool, and needle files. Most of these can be easily found at the sort of hobby shops that carry model kits and miniatures. Opening the eyes is done with many small cuts and a connect-the-dots technique. Although it’s tempting to cut all around the edge in one swoop, there’s a risk of cutting into the sides and leaving a gouge. Patience here pays off later. 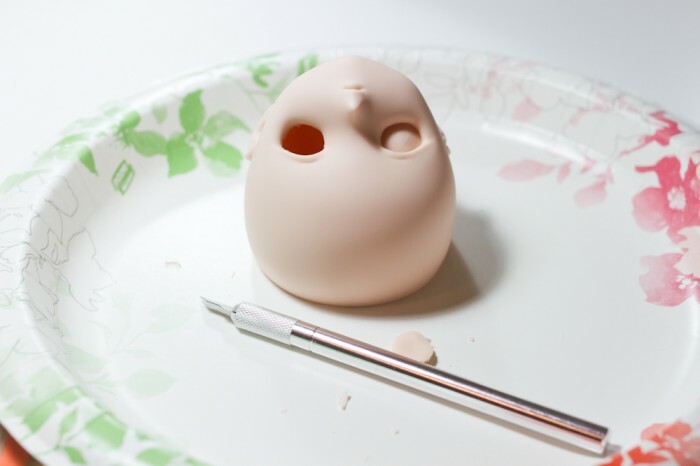 I also used the carving tool to peel away the lips and mouth. It’s done with small shallow cuts to avoid gouges and deep scratches. HDD-01 has an asymmetrical, smirky smile that was a bit distracting – removing it made evening up my eye mods a bit easier. After the major cutting is done, I do a smoothing pass with coarse sandpaper. Care is taken to avoid scratches on the cheek and nose. Needle files are used to smooth the inner eyelid- anywhere that’s going to be painted or blushed should be well sanded. Always wear a mask when sanding and filing! Working from coarse (150) to fine (800) sandpapers results in a smooth, even finish. When some imperfections are still visible, you have to go up a few grades to the coarser paper, then work back down again. In between papers I wash the face to remove any dust and grit. Ready to seal and paint!